Over eighty years of Love...our founder's story. 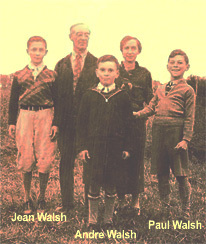 I was born Paul Patrick Noel Walsh to Simone Vennat and Richard Walsh in Brooklyn, New York on Christmas Day, 1926. After moving to Vineland, New Jersey, with my parents and my two brothers, Jean and Andre, my parents enrolled us at Sacred Heart Catholic School and I graduated in 1944. I was raised in a very loving home, with strict morals and discipline. Very early in life our parents taught us to love prayer, Holy Mass, Communion, the Rosary, and our God and Heavenly persons. In 1945, before the end of the Second World War, in July 1944, I was enrolled in an Army Specialized Training Program, which took me to Catholic University of St. Bonaventure in New York State and New York University in January 1945. Shortly following I was transferred to Army Basic Training in Texas. In June, I attended a teletype course in Scott Field, Indiana and was discharged at the end of the War in November 1945. In January, 1946, I entered St. Joseph's College Pre-Med Program in Philadelphia, Pennsylvania, with the intention of becoming a doctor and graduated from college in 1948. I enjoyed college and it did not take me long to find a girlfriend, and before long we were talking about getting married after I graduated from Medical School. On Christmas Day 1946, my 20th Birthday, while dancing with the girl I intended to marry, the Lord spoke to me, saying "I want you to become a priest." Although my fiance was greatly disappointed with this news, she understood I must follow my conscience. Only I had no intention of becoming a priest and ignored the Lord, and decided to tell no one else. I found myself unhappy and troubled, as several months passed. Then, while saying goodnight to "My Intended," the Lord called me a second time. I continued to ignore His call. During my senior year, I continued my efforts to stir up enthusiasm for medicine and received news of my acceptance into Thomas Jefferson School of Medicine in Philadelphia, Pennsylvania. My continued unhappiness led me to two priest friends, my Chemistry Professor at the time and my professor from St. Bonaventure's, the "Judge." They both advised two things, Our Lord was calling me and if I wanted to be happy, I needed to say "Yes." 2)My former peace of soul and happy disposition returned. 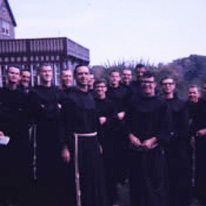 Next, I attended Franciscan Novitiate in Patterson, N. J., in August 1949, and Holy Name College in Washington, D.C. for four years of Theology. On September 18, 1953 I was ordained a Priest in the Franciscan order. 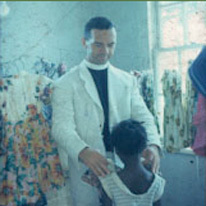 Within a short time, I was sent to Jamaica, to assist in establishing Our Lady of Angels Catholic Church and Preparatory School in Kingston, Jamaica. During this process, I came to realize I was among the poorest people in the world. Seventy percent (70%) of the people in Jamaica are poor and thirty percent (30%) are destitute. 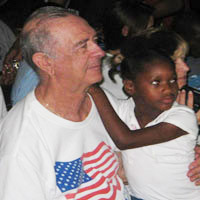 I immediately began to help the poor families I encountered, while establishing a primary school at Our Lady of Angels. Marriage was rare in Jamaica, and the men generally did not assume responsibility for their families. This culture of Post-Slavery was working against my efforts to help these poor families, so I prayed for an answer. 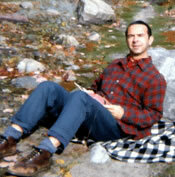 In 1960, I was transferred back to the United States to work in a Prison in Dannemora, New York. I kept in touch with those poor families and children back in Jamaica, and continued to support them financially by sending them my salary. 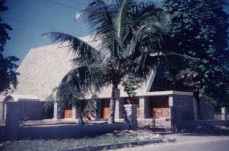 In September 1973, I was granted a transfer back to Jamaica, to work as the Pastor of Our Lady of Angels Church in Kingston, Jamaica. Shortly following, with the help of a group known today as my Board of Directors, I began St. Anthony's Children's Home and made the decision to dedicate the rest of my life as a father to Jamaica's poorest. I had seven years to prepare a unique home. Unlike what many believe, my life with children has been very difficult. Being a father or mother in our present age is not easy. God provides deep spiritual satisfaction for me and only true love can solve this social problem. The appreciation and respect I receive from the poor encourages me. I am an oddity amongst my own. 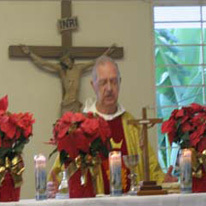 The only priest in a Province of over 600 men involved in a children's home. Yet, the whole idea was not my own; God's calling for this particular work was strong, clear and unmistakeable. I continue to have severe opposition on several fronts. I ask all of you to pray for me and this ministry to persevere, no matter how intense this opposition becomes. There is too much at stake for any of us to give up. A home of hope, leading my misguided children into positive-thinking youth, prepared to accept responsibilities, and make them examples for the younger ones. I am very proud of all my children and I pray the older generations continue to be good examples for the younger ones. With every child I begin by adopting them in a practical way, in the role of a loving dad. I raise each child with love, praise and encouragement, but with strict morals and discipline. I teach them the importance of prayer and fidelity to God's Commandments. As a family we pray together daily, focus on Christian values and principles, and not on conversion to the Catholic Faith. I love each child that I help to raise; I will always be here, as their dad, until our Heavenly Father leads me Home. St. Anthony's Home is today and always will be God's work. As we celebrate our 38th anniversary in 2010 our work continue s, and to the future we trust in His plans.